Google just announced a brand new redesign to its iconic logo that's sleeker and simpler than the previous one. "Google has changed a lot over the past 17 years — from the range of our products to the evolution of their look and feel," the company wrote in the caption for a YouTube video introducing the new logo. Although the logo change seems simple, the company gathered designers from all across the country to meet in New York for a "week long design sprint," the company says in a post on its design blog. But before Google decided on its new look, it went through a few other logo choices. 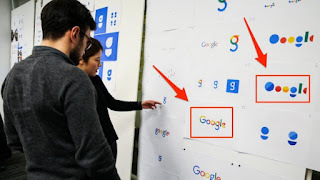 (Google) - You'll notice Google experimented a lot with Material Design, the new type of design language Google introduced in the previous version of Android that emphasizes bold colors. The company also played with multicolored letters too.